I was sent on a last-minute mission the other day, to find a pair of pyjamas for a bride who was getting married the next day, and needed a lovely pair of pyjamas to wear in the morning whilst getting ready. No probs, I thought, this won't take me long. Well, high street, you really let me down. What I was envisaging was a cotton pair of pyjamas, with a shirt style top which buttoned-up, maybe in a polka dot or stripe. What I was confronted with was a mass of polyester "novelty" sleepwear garments, none of which could anywhere near fit the bill. I've now got it into my head that I need pair of these elusive pyjamas myself - probably something to do with the autumnal feeling in the air - so am now considering the selection below (including a couple of nightshirts). They have to be the old-school button up style. I particularly love the selection they have at Hush - they have an extensive choice so it's worth visiting their website. 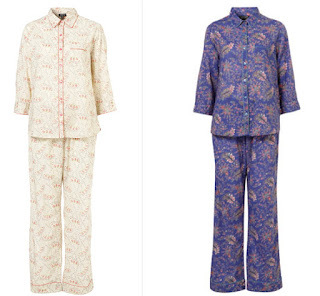 I think a PJ set would be the perfect inhabitant of my Christmas stocking (first Christmas hint of the year!). Which pair would you go for? Stripe flannel pyjamas, £69 Toast; Pretty pansie nightshirt, £25 Topshop; Dandelion pyjamas, £49.50 Hush; Hannah spot pyjamas, £35 John Lewis. Vintage bird print night shirt by Dickins & Jones, £45 House of Fraser; Spot PJ set with bag by Dickins & Jones, £60 House of Fraser; Lola Rose bunny print pyjamas, £55 John Lewis; (also available in a pink horse print); Small starts pyjamas, £49.50 Hush. And these two pairs from Topshop really caught my eye - at £28 a set, 100% cotton and in gorgeous prints, these PJs will be hard to beat. TK Maxx is another port of call for a nice pair of pyjamas too - keep popping in because you never know when you'll strike lucky. But my all time favourite pair is this set below from J.Crew. At nearly £70 it's a lot to spend on a pair of PJ's but I'd say that these are pretty near perfect. They also come in pale blue, and J.Crew is offering free shipping on world-wide delivery until 30th December. Worth the splurge? Green spotty pyjamas - hope Santa puts them in my Christmas stocking! Oh, these are all too gorgeous. 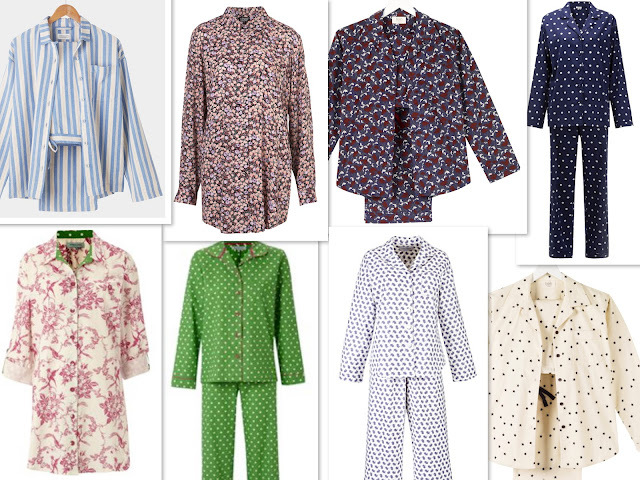 Cotton button up pyjamas are in my top 20 favourite things. Maybe even top 10. The small stars ones from Hush are darling! And the Topshop ones are also beautiful. Actually, they are all my favourites.